In May, Chilean activists Exequiel Borbarán and Diego Guzmán were murdered in Valparaíso at a large student demonstration. Another college radical, Rodrigo Avilés, was sent into a life-threatening coma after police attacked him and his comrades with a motorized water cannon or guanaco, slamming him to the ground, resulting in severe head trauma. The Chilean government’s recourse to routine repression during recent protests, despite promises to address popular grievances, reveals an increasingly exhausted ability to absorb demands from below. 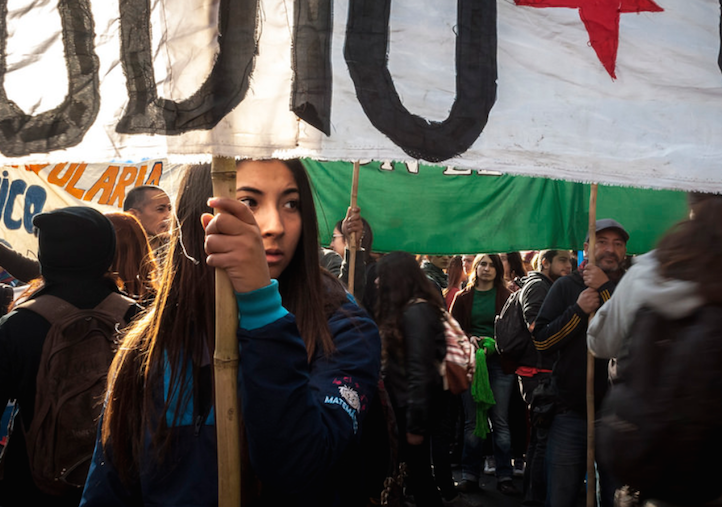 After a twenty-year absence of popular mobilization, since 2006 a growing student movement calling for an end to the commodification, fragmentation, and inequality in the educational system has transformed Chilean politics. The movement has been punctuated by moments of quantitative and qualitative growth. In 2011, it reignited with unprecedented force and began attracting support from new generations of worker activists. More recently, it remobilized alongside new working-class insurgencies and expanded its anti-neoliberal demands. The center-left government — led by Socialist president Michelle Bachelet — that returned to power in early 2014 campaigned on a reform platform that included a progressive transformation of the country’s schools and universities. But Chilean students think Bachelet’s piecemeal education reform (passed in January) is too little, too elite-driven, and too late, and in response have relaunched one of Latin America’s most formidable current movements. The student movement, as it has for nearly a decade, is demanding a genuinely nationalized education, and a reversal of the extensive commodification of instruction, which has only deepened since the 1973-1990 dictatorship’s forceful liberalization of schools. Chile has been engulfed in protest in recent months. On May 28 over 100,000 students took to the streets, and a fortnight later, over 200,000 demonstrated nationwide. They marched with teachers, unionists from strategic industries, direct-action environmentalists, Mapuche land-resisters, and welfare rights activists. On June 17 over 100,000 striking teachers marched in Santiago. They were joined by thousands of subcontracted employees from the capital’s partially privatized transit system and precarious miners who weeks later initiated a series of roadblocks and occupations to force the national mining company to improve previously negotiated standards for bidding contractors. These groups are cohering into a working-class pole that has the potential to bury Chile’s democratic neoliberal regime, which has lost the hegemonic power it enjoyed for two decades following the 1989-1990 transition. The power and energy of the recent upsurge is in some respects surprising — at the end of last year protests seemed to be ebbing. The killing of Borbarán and Guzmán occurred at a time of uncertainty and possibly even stagnation in the popular push for social and economic democratization. Indeed, when Bachelet passed her first school reform tweak in January, the student movement was uneasy and unsure of its next steps. Despite mounting discontent from all popular sectors, it appeared as if Bachelet’s official reform program coupled with a mild and aborted attempt at populism might dampen and even disarticulate the growing and converging movements. With official support of the Communist Party, including key leaders of the 2011-2012 student insurgency, the second-time president also passed a batch of education and tax legislation trumpeted as anti-elite measures that would reduce inequality. Bachelet proposed a labor reform package that, while pitched as a reversal of Pinochet’s destruction of collective worker rights, actually enhances employers’ power. More recently, the regime has been mired in corruption scandals that have eroded its little remaining legitimacy. However the scandals have also shifted attention away from structural change toward demands for clean government and solid institutions, threatening to replace national conflict over anti-neoliberal reform with concerns over responsible governance. All this changed on May 14 when students remobilized to demand universal and democratic public education, stronger measures protecting workers’ rights, and the establishment of firewalls separating business from party elites and policy making. The demonstrators also voiced anger at Bachelet’s plan to overhaul teaching through Arne Duncan-style standardization and competitive, bonus-induced professionalization schemes. Tens of thousands of teachers and militant rank-and-filers from industries like the ports and copper mining joined the high school and university students for the national mobilization, and 150,000 marched in Santiago alone. As the march wound down into the port city of Valparaiso, Exequiel and Diego were caught in an altercation with a vigilante who unloaded his shotgun into their faces. The murders do not signal the reappearance of fascist elements in Chilean politics as some have warned; there is no viable foundation for a middle class reaction against the reemergence of protest in Chile. Nor are the assassinations particularly meaningful as inevitable social pathologies resulting from the country’s savage neoliberalism. After all, the same extreme market model has engendered, albeit after a long delay, strong solidarity and humanistic behavior among the country’s allegedly alienated youth. The killings of Exequiel and Diego are significant for another reason. They delineate battle lines and opposing forces in the rekindled and decisive conflict over substantive democracy. In this conflict the neoliberal managers led by Bachelet’s expanded center-left coalition who aim to preserve the status quo are pitted against all the sectors that want to radically transform the post-authoritarian regime by disrupting rather than participating in elite institutions. This is not the first time these conflicting forces have faced each other down. The difference between today’s upsurge and previous mobilizations during 2006 and 2011 is that alliances built around a common anti-capitalist program are now congealing in a concrete way. The renewed militancy and certainty of Chile’s insurgents has seriously eroded elite confidence that Bachelet’s coalition can give the regime a new lease on life. In the transition from dictatorship, Chile’s democratic regime emerged as the region’s most gilded neoliberal order, predicated on the absolute disarticulation of non-elite capacities coupled with bipartisan oligarchic rule, and buttressed by state repression. When radical reformer Allende was elected president in 1970, Chile had one of the most militant and politically successful working classes in the world. The junta that overthrew his government quashed the country’s popular sectors physically, organizationally, and structurally. After assassinating, disappearing, or exiling the class’s vanguard layers, the military regime banned all political organizations that advanced non-elite interests and restructured industry and social provision, fragmenting and dispersing Chilean workers and producing a near-complete dissolution of non-elite capacities. Chilean political institutions were also refashioned to prevent non-elite collective action from challenging elite interests. When the dictatorship agreed to hand over power to civilian rule, it did so in a tightly negotiated transition. Radical left parties had been eliminated, like the MIR; marginalized like the CP; or renovated, like the Socialists. The Socialists, after their leadership’s market aggiornamento under the influence of social democrats in Western European capitals and think-tanks, allied with the Christian Democrats (a party instrumental in calling for Allende’s overthrow in 1973) to win elections with overwhelming support from ordinary people who simply wanted an end to authoritarian rule. The new alliance, the Concertación, agreed to leave the neoliberal regime’s pillars intact beyond the formal restoration of civil liberties. The new center-left government reversed the most egregious safeguards put in place by the military, such as designated and lifetime senators, but did almost nothing to modify Pinochet’s labor code, school system, or deregulated, commodity-based, export growth model. Concertación commitment to the dictatorship’s fundamental rules was cemented by a binomial electoral scheme which consolidated power-sharing between competing coalitions. By eliminating third-party challengers, it served to lock in popular resignation and solidify partisan ties to business, as politicians and state managers became exclusively beholden to the interests of economic elites. The guarantee of roughly half of all parliamentary seats to each rival alliance promoted oligarchic control of party apparatuses and engendered a powerful caste of brokers who managed the state in ways that would make US revolving-door politicians blush. A third and paradoxical feature of Chile’s post-authoritarian neoliberalism has been the ever-present threat and all-too-frequent use of state repression. Collective action that evaded the overwhelming combination of popular disempowerment and oligarchic rule has been ruthlessly put down by the tensely-coiled shock carabineros, the state’s militarized police force. Whereas the military regime used force to obliterate decades of working-class organization, the Concertación now unleashes its Special Forces, dogs, and guanacos to discipline fledgling mobilization. The Chilean state, and the political class more broadly, denounced the murders of Exequiel and Diego, but reframed the conflict as a problem around the right to protest, ignoring the substantive grievances animating the protests. Key government figures decontextualized the mobilizations, treating the conflict as an expression of sui generis social animus. The irony was not lost on the movement and growing ranks of working-class insurgents. Since 1990, governments of the Concertación, the same coalition to which Vallejo and the CPCh now belong and whose educational reform package Eyzaguirre is charged with bringing to fruition, have repressed all signs of protest. The ANI (like its murkier predecessor simply known as la Oficina) regularly coordinates with the carabinero Special Forces to quash signs of dissidence. In 2011, a student was shot dead by carabineros at the height of the mobilizations challenging Sebastián Piñera’s center-right government, and in total, over a dozen young activists have been assassinated since re-democratization. Cristian Cuevas, the Communist organizer who led precarious copper workers in a historic 2007 industry-wide strike, accused the Interior ministry of once more resorting to “mano dura” against worker activists. Students understand that state coercion is intended to remove insurgents from occupied streets, worksites, and campuses, and their concerns extend beyond escalating repression. Unfazed, they called for an immediate and permanent escalation to push beyond Bachelet’s tightly controlled official “reform” agenda. Determined to resume the offensive during what remains of 2015, which they proclaimed the “Year of Education,” they responded to the deaths by shutting down the capital. Tens of thousands of high-schoolers disrupted midday traffic preparing the scene for an evening convergence of older students, teachers, and parents. Efforts to connect with other struggles and cohere a radical bloc around core demands are also bearing fruit. On June 16 Santiago University hosted a national Gathering of Mobilized Organizations. 200 representatives of unions, teachers and students, and shanty-dwellers packed the hall to proclaim the construction of popular unity through common action from below. Encouraged and sensing a growing capacity to defeat neoliberal education and labor reforms, the Confederation of University Students (CONFECH) later called for an indefinite national stoppage. During Bachelet’s first term, the Concertación’s ability to preempt popular mobilization was already showing cracks. Fortunately for elites, the inexperienced and isolated middle and high school student movement — called the pinguïnos for the students’ black and white uniforms — that half-spontaneously erupted in 2006 to protest the degradation of Chile’s splintered school system was deactivated when the regime successfully coopted it though participation in working groups or mesas de trabajo. When economic elites turned to a center-right option for managing their affairs, the student movement re-exploded in 2011. Bachelet’s successor, Sebastián Piñera, failed miserably in his attempt to demobilize students through “participatory” task forces, and finding no answer for the endless waves of marches and school occupations by university and secondary students now inoculated with a dose of class distrust, his center-right coalition unleashed a scale of repression, resulting in hundreds of nightly arrests, not seen since the dictatorship. When force failed to hold back the movement, business elites had no choice but to restore the Concertación to power. Their gamble to promote the pro-Pinochetist wing of the state to the presidency had backfired, so they once again settled for the Christian Democrats and Socialists who had managed their affairs with relatively little turbulence. To ensure their return to power, business semi-covertly expanded funding for their campaigns, and while some capitalist sections continued to bet on the partisan right, heavy hitters from all sectors pumped NM candidates and Concertación brokers with decisive funding. Bachelet’s placement of pro-business managers in key ministries such as Economy, Mining, Labor, and Interior along with today’s corruption crises stem from this shift. Mass disruption had forced the Concertación to campaign on a comprehensive reform platform. But its business constituency, in a series of backroom deals, straightjacketed the substance of its legislative program, promoting the ongoing showdown with burgeoning popular capacities. Swapping coalitions proved ineffective at curbing protest. Without a credible left partner to vouch for the reform agenda brandished by the new and improved Nueva Mayoría, its class biases would unavoidably intensify new insurgencies. Enter the Communist Party. Bachelet and her advisors believed they could reverse the consolidation of Chile’s new radical movements and restore “consent” to the regime’s foundational rules by including the party in the center-left alliance. The marginalized Communists had spent years proposing an alliance which would guarantee uncontested Concertación rule in exchange for moderate social reforms, but were always rebuffed. His recognition was a celebration that the CP’s promise to govern with “one foot in la Moneda and the other in la Alameda” amounted to marching in lockstep with elites. Compounding NM’s political failures, Bachelet’s regime has become mired in scandal. Her son, a midlevel Concertación operator, acquired a personal loan from the banker owner of Chile’s most powerful conglomerates and used it to flip a property for millions in profits, while Bachelet’s inner circle has been illegally soliciting funds from influential members of the business community including Pinochet’s son-in-law, former head of Chile’s powerful peak business association and majority owner of the country’s largest mining interest. The precipitous loss of legitimacy from the seemingly bottomless scandal is now fueling even more mobilization. The Chilean left faces the same obstacles today — industrial disintegration, disarticulation of popular organization, and a radical recommodification of basic goods — that have hamstrung working-class collective capacities for the past two decades. So not surprisingly, popular capacities first reappeared in education, an arena in which institutional infrastructure binding students and teachers through networks of solidarity survived, despite privatization and fragmentation of schools. The federated structures of secondary and university students were available for re-activation once students came together around shared demands. When unfulfilled promises of competition for knowledge, skills, and credentials and skyrocketing private household expenditures dislocated broad layers of working-class youth, students used these surviving organizational resources to remobilize. Similarly, even though the military destroyed the national teacher’s union, the professional “guild” or colegio that replaced it continued to aggregate public educators, despite excluding those working on irregular contracts and outside state-run municipal schools. The CP, having lost influence in other areas, gained command of the colegio de profesores and campus federations, and up to its official incorporation, the party worked to bolster these associations, which it then parlayed into its alliance with the Concertación. As militant students and teachers coalesced within preserved structures, they successfully expanded their organizational resources despite constant CP efforts at vertical control. Teachers, increasingly skeptical of Communist stewardship, reinvigorated rank-and-file worksite assemblies and even took control of important locals. The militancy of new teachers, developed during the 2006 and 2011 student rebellions, boosted independent teacher networks. Students, in turn, broadened CONFECH membership in 2012 to include private colleges, which enroll up to three quarters of post-secondary students. Workers in other sectors meanwhile had to completely rebuild their organizations in the face of industrial disintegration and, the herculean organizing efforts of Cristian Cuevas in the copper industry notwithstanding, cope with Concertación/Communist control of weakened and passive unions. Workers from these strategic sectors have increasingly joined the students in their mobilizations, and have displayed their leverage even more powerfully through industry-wide strikes, which would have been unthinkable a decade ago. Outsourced copper workers led a 2007 national copper strike while dockworkers have launched rolling strikes affecting Chile’s main ports for the past few years — a significant development considering refined copper and copper ores account for 55 percent of the value of Chile’s exports. More recently, in Chile’s ports — a key node of the country’s extractivist economy — dockworkers recently employed a bottom-up strategy for developing associational power and successfully took control of some of the main terminals’ hiring halls. This growing pressure from social movements is at the root of the Chilean government’s decision to incorporate the Communist Party into ruling circles as a stabilizing force. Communist pro-regime functionality has been most glaring in the party’s defense of Bachelet’s school and labor reforms. When Bachelet presented piecemeal changes for ending profits, co-payments, and screening in schools, the new radicals — representatives and rank-and-filers alike — immediately rejected the proposal. They impugned loopholes affording private management firms, known as retainers or retenedores, ample and conspicuously hidden opportunities for profit. More importantly, while undeniably offering poor families free access to subsidized schools, the reform in many ways deepened neoliberal instruction. By entrenching the voucher system and intensifying competition by retainers for public transfers, student rebels claimed that it weakened public education. Educators likewise repudiated the reform and voiced additional displeasure with its silence on longstanding and unattended grievances, or deuda histórica, originating in the dictatorship’s slashing of wages and benefits. Called out by radicals from below, NM leaned on the Communists for credibility. As it would later do in relation to Bachelet’s teacher professionalization and labor schemes, the party lent its immediate support. Teacher union president and Communist bureaucrat Jaime Gajardo jumped out in front of exasperated teachers and praised the trifling school reform. As the end of 2014 approached and Congress took up the legislation, the Communist youth, with the political and institutional resources at its disposal as junior coalition partners and seeking to exploit the sectarianism which momentarily took hold of the left-of-CP insurgent organizations around Bachelet’s campaign, made a push to retake the National University student federation which spearheads the anti-reform movement. With officialista élan, the party simultaneously deployed its new congressional cadre. When Vallejo hopped from the leadership of the National University’s student federation to Congress last year, and once there to chair the lower house’s education commission, her position in the politics of reform changed significantly. At the head of the Communist Youth led 2011 protests, Vallejo denounced Concertación complicity in blocking student demands, later vowing never to campaign on behalf of Bachelet. Now a member of the ruling coalition, her party committed her to securing the bill’s victory. A disciplined comrade, Vallejo teamed up with Minister Eyzaguirre to begin marshalling through the executive’s proposal. Finding itself at its lowest point since 2012, the movement had to regroup to defeat the CP-backed initiative. The new student radicals reacted decisively, coming together to win the December 2014 vote and effectively defend a strategy of continual mobilization coupled with ever-closer and explicitly anti-NM alliances with rebelling rank-and-file workers. Overwhelmed by spreading grassroots opposition, the party switched to marginalizing the rank-and-file. Disregarding the National Assembly’s mandate, Gajardo agreed to a framework for negotiations with the government which clearly fell short of the “short agenda” points they had voted for. Incensed, locals throughout the country joined a cascading stoppage, culminating in hundreds of paralyzed school districts by November 2014, that put Gajardo and Bachelet on notice. Bureaucratic marginalization having failed, the party next called on its fixers to contain the spreading revolt. The party’s General Secretary, Juan Andrés Lagos, was dispatched by the Interior Minister with express instructions to deactivate the rebellion in time for the decisive January 2015 congressional vote. By then, however, the party had lost control of the rank-and-file. Dissident leaders and locals ramped up their wildcat campaign. When Bachelet introduced her teacher professionalization plan this April, teachers did not wait on Gajardo to act. They immediately called a national strike with the express aim of forcing Bachelet to withdraw the legislation. Beginning in June, one by one, schools, many of which were being simultaneously occupied by students, shut down. The strike, which continued for over a month, called for a new and qualitatively different “professionalization” framework reversing the secular degradation of teaching and supporting instructional development through smaller classroom size, increased prep time, and democratic workplace planning. Propelled by the massive revolt, Gajardo reluctantly found himself at the head of teacher militance. Still, it was no secret to rank-and-filers that his main objective was to call off the strike. Throughout the stoppage thousands kept watch outside the Colegio’s national council meetings to discipline their officials. Signs warning against betrayal made plain that the revolt was against both the regime and their leaders. Unable to cool the rank-and-file, Gajardo and the party turned to their final tactic. Communists now proposed collaborative dialogue to rescue Bachelet and deliver a much needed political victory. From Congress, Vallejo mustered all her political capital and, expressing sympathy, called on teachers to join a tri-partite committee to further discuss the bill. The Colegio was invited to make friendly amendments in what was presented as a transparent gesture of openness and responsiveness. Following the script, Gajardo advocated for demobilizing and joining talks. But in a crushing victory, the teachers’ national assembly voted overwhelmingly on June 28 to maintain rejection of the proposal and continue the strike. Though Vallejo berated teachers for their ingratitude, Eyzaguirre vowed to not give into the blackmail of “teachers who are violating our children’s right to an education,” the state began docking strikers, and the stoppage effectively abated as Bachelet opted to end the school year early, the rebellion was a resounding success. Eyzaguirre was sacked, Nueva Mayoría was forced to continue tri-partite negotiations having backed off its intransigence, and Vallejo conceded, counseling the incoming minister to engage in unconditional talks. The party’s strategy of legitimation, marginalization, containment, and participatory salvage had failed demonstrably. NM legislators, including all CPers, eventually closed ranks and rammed through the “carrera docente” bill even after Vallejo’s commission had been forced to vote it down. Later and true to form, Gajardo provoked a division down the middle of the Colegio’s National Assembly and finally delivered an official end to the strike. In the process, however, a consolidated dissident faction has established the social and organizational power to contest elite-backed initiatives, independently mobilize its growing militant base, and credibly dispute leadership positions. With these capacities radical teachers, who for the moment have assumed the lead of insurgent mobilization, have landed destabilizing blows against the elite-sponsored reform agenda. The success of the teachers thus extends beyond clearing neo-Stalinist tripwires and compromising Bachelet’s teacher reforms. Their mobilization underscores the ability of rank-and-file rebels to set and push through an agenda in terms that escape the regime’s core strictures. In derailing Communist coaction, radical educators, like student activists, are subverting the regime’s basic viability. And like in the student movement, insurgent teachers are poised to seize the leadership of their official structures. This accomplishment will represent a sort of passing of the baton from students to labor. With the consolidation of their capacities, radical teachers, along with miners and dockworkers, will be at the vanguard of Chile’s new movements, an unthinkable development a decade ago, and much closer to radically transforming Chile’s neoliberal order. Chile’s new radicals have overcome the material bases for their fragmentation, and have generated the organizational resources to turn their potential leverage into actual systemic costs for elites. Now they must develop the political power to force through a transformation of the post-authoritarian regime’s decision-making institutions. Presently, successive blows from below have weakened the regime and pushed it into the realm of concessions. But for leftists to impose more radical change, they will have to conquer institutions of power the same way they have come to control student and labor movements. Only then, for instance, will any constituent process translate into a new political order rather than scaffolding for the current one. Fortunately, the lessons derived from the ongoing cycle of mobilization have underscored this imperative for the country’s new rebels. It is only a matter of time before Chile’s new working-class insurgents develop the political instruments needed to bring down post-authoritarian neoliberalism and build new anti-capitalist social and political institutions in its place. New movements in Chile are fighting to bring down the country’s post-Pinochet establishment.